While reading The Cloud Roads by Martha Wells I was reminded of how much I enjoy stories with a floating island in them. It doesn’t seem to be a really common trope, and it got me digging into my bookshelves to find instances of it. Floating landmasses, like the one they had hit, dotted the sky. One plowed through the clouds, roiling the white into a gray. Lightening flickered in the tight knot of polarized air, like a storm inside a bottle. That island was a wedge of stone, perspective obscuring its topside. An island farther in the distance, though, showed a crown of thick green. He would only see the top of the island if it was traveling up a curve. She turned the book so she could read the detailed listing. Like most vimanas Icarus was roughly boat-shaped with the tapered bow cutting the wind. It was the stern of the landmass that they needed to worry about. Icarus was sixty miles wide and a hundred miles long — one giant sized rain-collector. the overflow poured down off the back end of the vimana in a mile high waterfall. If they were hit by it, nothing on the Rosetta would survive. Moon turned back toward the sky-island where it floated in isolation over the plain. He pushed himself higher until he was well above it. He circled over the island. Its shape was irregular, with jagged edges. It had been hard to tell how large it was from the ground; from above he could see it was barely four hundred paces across, smaller than the Cordans’ camp. It was covered with vegetation, trees with narrow trunks winding up into spirals, heavy falls of vines, and white, night-blooming flowers. But he could still make out the round shape of a tower, and a building that was a series of stacked squares of vine-covered stone. There were broken sections of walls, choked pools and fountains. He spotted a balcony jutting out of curtains of foliage and dropped down toward it. 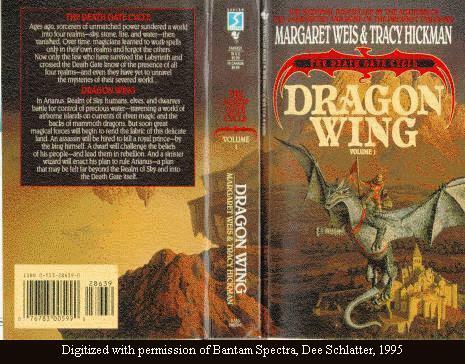 In the Death Gate Cycle by Margaret Weis and Tracy Hickman has several worlds created by a Sundering. Arianius, Realm of Sky, is where the first book, Dragon Wing is set. It has floating islands all over, on three different levels – the High realm, the Mid realm, and the Low realm. These islands are vast, and dragons or flying ships are used to fly between them. All the floating isles in the Realm of Sky are composed of coralite. The secretion of a small, harmless, snake-shaped creature known as the coral grubb, coralite is spongelike in appearance. When it hardens, it is as strong as granite, though it cannot be cut and polished. Coralite forms very fast; structures made out of the substance are not built so much as grown. Coral grubbs give off a gas that is lighter than air. This keeps the isles suspended in the sky, but can be a nuisance when attempting to construct buildings. The magic of first-house land wizards is necessary to remove it. Coralite gives off a faint blush of light, causing strands of forest to show up black against the silvery radiance of the ground. Landmarks were easy to locate. Castles or fortresses made of coralite that have not been covered over with a paste of crushed granite gleam softly. Towns, with their shining ribbons of coralite streets, show up easily from the air. Can you think of other books with this trope in them? I already have my eye on The Floating Islands by Rachel Neumeier, but I don’t know what else is out there. Just to be clear: the floating island is different from say a floating castle or other man-made floating thing (like the moving castle in Howl’s Moving Castle or airships in many books). This entry was posted in rants and raves and tagged reading raves, tropes i like by janicu. Bookmark the permalink. Oh, boy. You really need to read Neumeier’s book then! *nudges gently* I loved it, but as a confessed fan of her work I might be a bit biased. Even taking that into consideration I still think you’ll enjoy it (at the very least; you’ll probably outright like it, period). The descriptions alone…And that’s not mentioning how awesome Trei and Araene are! I’ve had Elizabeth Haydon’s The Floating Island for a long, long while. Back when it was brought home from the store, I didn’t get far before putting it aside – can’t remember the reason why just now, nor can I say for sure that it’s an honest-to-goodness floating island, though I think it is. Otherwise…Yeah, not many come to mind. Huh. I liked but didn’t love the first two of her Griffin Mage trilogy (still need to get to that third book!) but her FLOATING ISLANDS story sounds very different so I’m quite curious! I think Haydon’s book showed up on amazon when I did a “floating islands” search but I didn’t investigate much. Is it an MG? That was my impression from the cover. Like you, the Griffin Mage books weren’t ones I loved, but I did deeply enjoy The Floating Islands, and (like Chelle) love her first book, City in the Lake. This makes me feel better about giving her other books a go, thanks! Hmm…It might be considered MG, but older. It’s been a while, but I think I may have had a hard time getting into it. The reviews are pretty solid, though. I have Neumeier’s The Floating Islands if you’d like to borrow it, Janice! I’m even seeing our book mule this weekend if so. 😛 I haven’t gotten to read it yet myself, but am excited to get to it at some point down the road (so by all means, if you’d like to borrow, feel free to do so before I get to it). I also have Castle in the Air by Diana Wynne Jones waiting on my end table at the moment, which may contain floating islands? A floating castle at any rate, though on the cover it’s made of clouds, so I’m unsure. Have you seen Miyazaki’s Castle in the Sky? That’s definitely floating islands! We own a copy, but I’m not sure I’ve ever watched it…need to get on that. Loving the art you included in this post! Yep, I think I read Castle In the Air a long time ago, but it’s hazy…I don’t know if there is a floating island there. And same with Castle in the Sky — we have a box set with a bunch of Miyazaki’s movies and we watched them all in a binge several years ago. I probably should do a rewatch at some point! OK, will do. I was moving some stuff around yesterday and really.. I have a HUGE TBR. I think I need to reinstate the “no more buying or borrowing books” policy for a while. Love the artwork that you posted! But I don’t think I’ve read a book with a floating island in it. I’ll let you know if I ever come across something like this though. Looking for the artwork was fun. 🙂 OK, keep your eyes peeled. This trope seems hard to find.